In normal pregnancy an ultrasound is performed four times, and each time it determined the dimensions of the embryo or fetus. The first study performed in the treatment in female consultation, followed by three mandatory prenatal screening for the period of 12, 20 and 32 weeks. The doctor visually evaluates the condition of the embryo, fetal membranes, placenta, determines the amount of amniotic fluid (IAG). In addition, a number of measurements (CTE, BDP, TVP, coolant and length of bones), which help to clarify the term of pregnancy, to assess fetal growth and to identify, if any, for the vices of its development. What is measured during a screening ultrasound? When performing early pregnancy ultrasound determine the existence of pregnancy, the point of attachment of the ovum (to exclude ectopic pregnancy), and determine the size of the ovum. The embryo is visible on ultrasound no earlier than 6 weeks from the start of the last menstrual period (4 weeks from ovulation). If it is rendered, determine only the CTE (kopchik-parietal size). A little later, closer to 8 week you will measure your head and determine BDP (biparietal size). What is the symptom of a butterfly? In conclusion, after the first ultrasound screening is often mentioned symptom, or «the butterfly effect». So ultrasound diagnosticians call a picture of a normally developing brain, which at this period is very similar to the adult brain. Symmetrical hemispheres of the brain and lateral ventricles, with the frontal and occipital horns, if you look on top of them really resemble butterfly wings. Symptom of butterfly specialists in ultrasound diagnostics call normal pattern of brain development of the child. 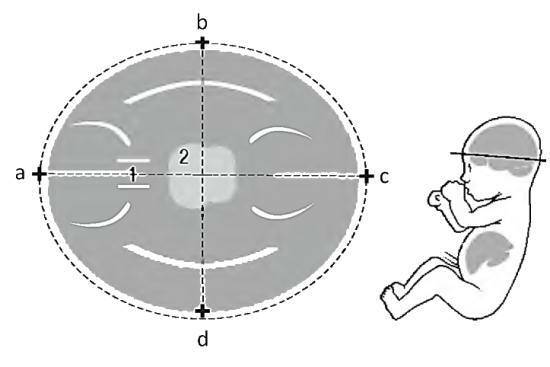 CTE (kopchik-parietal size) – the distance from the top of the parietal bone of an embryo to the coccyx, measured from the earliest period to 20 weeks. During this period to measure the full growth of the fetus is impossible because his legs are too small, permanently bent and given to the stomach. CTE fruit increases daily, so the determination of gestational age according to standard tables can give an error of ±3 days. BDP (BPD) – biparietal size (diameter) is determined from the outer edge of the parietal bone of the fetus on the one hand, to the inner edge on the other. This parameter is determined from 8 obstetric week of pregnancy and is used in order to assess the development of the fetal brain. In the later stages in addition to the BDP measure more and LZR (fronto-occipital size) or head circumference. Coolant (abdominal circumference) – measured at the level of the stomach, gallbladder and umbilical vein, allows to assess the development of the internal organs. Coolant is evaluated both independently and in relation to skeletal size. The length of the tubular bones: DB — thigh length, DP is the length of the humerus, DBB – tibia length – measured in order to assess how the development of the fetus corresponds to the gestational age. In the tables of normal values of the dimensions of the fetus by ultrasound usually specify three values, and in the cap there is often little understood by the word «percentile». What is it? It is a statistical term that indicates what percentage of the population made up of same or lesser value of the parameter. That is, if the table of TVP in 5 percentile value is 0.8 mm, then 5% of all examined it will be below this value, and the rest 95% is higher. In contrast, the 95% of the specified value is 2.2 mm, so TVP is more than 2.2 mm, only 5% of patients. Thus, a deviation from the norm are the values that statistically are not more than 5% of patients. The same principle applies to the estimation of the parameters of CTE, BDP, coolant, lengths of tubular bones and IAG. Indicators of fetometry are very individual, so non-compliance is the norm without further research is not a basis for diagnosis of IUGR (intrauterine growth restriction) or fetal malnutrition. In addition, the doctor understands the West and the rise of the woman, increase its weight and parameters of the fetus, as well as evaluates the condition of the placenta and placental blood flow, amount of amniotic fluid (IAI) and activity of the fetus. 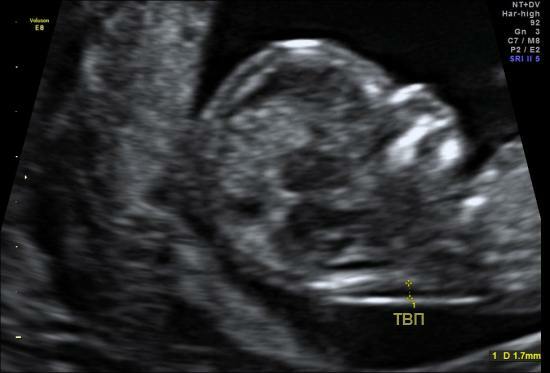 For the diagnosis of IUGR of the fetus is insufficient for the measurement of dimensions on an ultrasound. If they are below normal, an ultrasound is performed in the dynamics and further studies to determine the cause of the backlog. Error in the determination of gestational age: it is determined based on the start date of the last menstrual period, and the development of the embryo begins no earlier than ovulation will occur. The average time interval between these events is 14 days, but it can vary within wide limits. There are two forms of IUGR: symmetrical and asymmetrical. In the first case, all parameters: CTE, BDP length of tubular bones and coolant – are not evenly distributed. This form of gap development occurs during the second trimester of pregnancy and is considered to be prognostically more unfavorable. If behind only coolant, the rest fotometricheskie parameters in the normal range, say about the asymmetric form of intrauterine growth retardation. This pathology is more typical of the third trimester and prognostically more favorable. 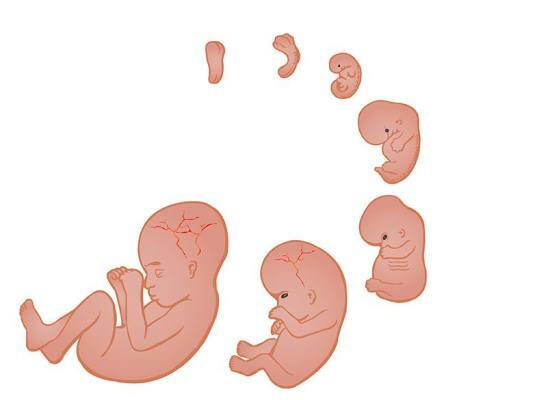 NT (nuchal translucency thickness) is measured at a certain position of the fetus is determined by the distance from the surface of the skin to the soft tissues of the neck. This figure is informative only from 10 to 14 obstetric week of pregnancy, and diagnostic value in identifying genetically determined malformations (congenital malformations of the fetus) large. 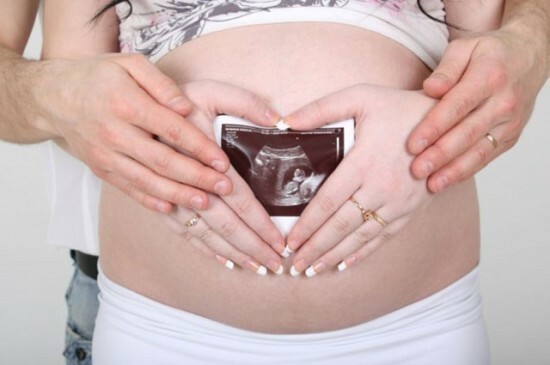 It is therefore necessary to pass II perinatal screening on time. Indicator TVP, along with other parameters, is used to calculate the risk of having a child with chromosomal abnormalities. When NT=3 mm, the probability of having a child with the CDF is 7%, i.e. slightly higher than the General population. If it is 9 mm, the risk reaches 78%. Extension nuchal translucency cannot be the basis for the diagnosis of the CDF is a measure of probability, it only indicates the need for additional research. The increase in the nuchal translucency of the fetus does not give grounds for the diagnosis, and only indicates an increased risk of having chromosomal abnormalities and the need for more complex diagnostic investigations. In the later stages of fetal with down syndrome can be increased the size of the coolant, while other parameters are within normal limits. In addition to the measurement of NT to identify chromosomal abnormalities is carried out biochemical analysis of blood (triple test), determination of the chromosomal parents and the fetus. For research use of the cells of the amniotic fluid or chorion, which get through a puncture in the abdominal wall under ultrasound control. This study allows to reliably determine the presence of anomalies and to establish an accurate diagnosis. IAG (amniotic fluid index) is calculated during the ultrasound examination automatically through software or manually. To do this, the uterus is divided into 4 quadrants and each of them measure the distance from the body of the fetus to the inner amnion. Values are summed. The firmware of some devices allows you to calculate IA in automatic mode. If IA less than normal, oligohydramnios is diagnosed, if the above – polyhydramnios. With water scarcity, the fetus is compressed in the cavity of the uterus, its movements are limited, possible compression of the umbilical cord. Polyhydramnios may indicate the presence of infection, and also increases the risk of premature rupture of waters, and early births. In both cases, the doctors recommend additional tests to find the cause of disorders and prescribe adequate treatment.